The aerospace sector is one of the most demanding sectors for coatings and materials. Aerospace coatings need to provide protection from corrosion, abrasion, weather, UV radiation, erosion, temperature variations, and more in the most extreme conditions. The aerospace industry can be divided into space, commercial aviation, military and defense, and business aviation. Across these segments, coatings come in a range of technologies for use in both exterior and interior applications – from wing coatings to heavy-duty cabin coatings – for OEM (Original Equipment Manufacturer) and MRO (Maintenance, Repair, and Overhaul/Operations). With aerospace coatings, the sky is the limit. In this article we look at the different aerospace segments and the coatings that serve them, as well as the companies and products available in the US. Commercial aviation – At any given time there are 5000 commercial airplanes in the sky over the US. The commercial sector relies on coatings for protection but also for brand recognition, so color is a hugely important factor. Long-lasting and durable coatings are needed to withstand the constant usage. Military and defense – The military sector requires specialty applications including for camouflage, chemical agent resistant coatings, infrared reflective coatings, and anti-static coatings. Space – Satellites, launch vessels, and other space-bound vehicles need specialty coatings to deal with the very specific nature of their use. These include solar reflection coatings, conductivity coatings, and even Vantablack. Cabins require protective coatings to withstand the constant influx of passengers. Last year, airlines ferried four billion passengers to destinations around the world. Cabin coatings need to deal with the knocks and scrapes of all these passengers day in, day out, year round and still look and feel good. 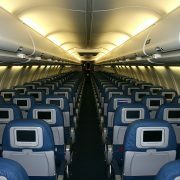 The cabin interior uses a wide range of coatings for the ceiling panels, walls, seats, and equipment like galley carts. For a passenger, the cabin is most of the flying experience and ensuring that the cabin provides a comfortable, positive and safe atmosphere is vital for customer satisfaction. The coatings used play a large role in creating this atmosphere. A cabin is high traffic and high use, with people, bags, and trolleys rolling through several times a day. The coatings used for every part of the cabin need to withstand this use without damage. Stains, scratches, and smudges all detract from the flying experience. Safety is also an important factor for interior cabin coatings. There are strict regulations regarding fire safety and flammability for interior cabin coatings, as well as the aircraft manufacturer’s own specifications. Interior cabin topcoats are often polyurethane based as the resin provides a soft touch, UV resistant, durable, attractive, and scuff resistant finish. Corrosion is a serious issue for the aerospace industry. It is hugely damaging, and airframe structures and surfaces affected by corrosion can impact flight safety of measures are not taken. Hexavalent chromium (chrome 6) was the most commonly used corrosion inhibitor for aircraft coatings until it was confirmed as a carcinogen. OEMs, MROs, airline operators, the military and coating manufacturers had relied on chrome for years, but the search for safe, viable and effective alternatives led to a wide range of formulations. Aerospace primers now focus on alternatives like magnesium-rich, lithium-rich, and powerful epoxies designed to provide wear and corrosion performance with a faster MRO turnaround. These chrome-free coatings (also chromate free coatings) are still constantly improving, with new formulations receiving approval every year. EXAMPLE COATING: Aerodur HS 2118 – a cutting edge, lithium based primer compliant with the AMS 3095A specification with the ability to replace washprimer systems. Aerodur 2111 is a chrome-free primer designed to Boeing specifications. The coatings systems used for aircraft exteriors includes primers, intermediate coats, and topcoats, and a 747 will use about 300 gallons or 600-1000lbs of paint. An A380 can require up to 1000 gallons of paint. These coatings are spray-applied in very thin layers, ensuring an even and perfectly cured application. Airlines repaint their planes every 5-8 years and the expensive painting period downtime can be days to weeks. In the interest of cutting downtime and increasing efficiency, selectively strippable systems have been introduced. They allow planes to be repainted up to 30-40% faster by removing the top and intermediate coats without damaging the corrosion-resistant primer. These systems also reduce the amount of chemical strippers required. EXAMPLE COATINGS: PPG Desothane HD Basecoat/Clearcoat system which provides a superior colour coverage with a high gloss clearcoat. PPG combine this with the chrome-free Desoprime 7049 primer for aircrafts, which is left intact in future repainting. Wing coatings need to withstand wind, hail, rain, bugs, birds, UV, and more. Smooth and uninterrupted airflow over a plane’s wing is vitally important to the efficiency of flight. A bird strike may be obvious in its damaging potential, but even bug guts can disrupt and damage an aircraft. Bug guts sticking to the wings of aircraft cause drag during takeoff and landing to such a degree that NASA and Boeing are working on developing a coating to combat the problem. Outside of the bugs, wing coatings need to deal with UV radiation, leading edge erosion, abrasion, and corrosion. Leading edge erosion is a problem also experienced by wind turbines where the front edge of a wing or blade erodes due to constant impact with rain, dirt, bugs etc. When an aircraft wing arrives at the assembly and paint line it is, like all other commercial airplane skin panels, covered in a green protective coating. Once this is removed, the paint system is applied. 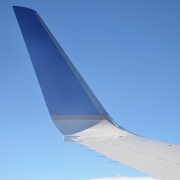 Aircraft wings are also coated with an impact resistant paint system. The walkways on aircraft wings are also coated, this time with a non slip walkway coating for escape routes and cargo floor panels like AkzoNobel’s Aviox. EXAMPLE COATING: Aeroflex HS 113F02 – a three component polyurethane high gloss wing coating with excellent flexibility for exterior use on the upper surface (in-spar) of the wing box and horizontal stabilisers. A Boeing 747 flying from New York to London will burn approximately 1 gallon of fuel per second, adding up to roughly 20,000 gallons of fuel across the whole 8 hour trip. The plane itself can carry about 48,000 gallons, while the Airbus A380 can carry 85,000 gallons of fuel. Given that fuel keeps the plane in the air, it is important to make sure that it is protected from contaminants from the fuel tank, and that the highly corrosive fuel does not eat away at the tanks and lines. Aerospace fuel tank coatings need to have excellent adhesion to metal substrates, excellent fluid resistance, durability, a wide-ranging service temperature, and comply with a range of safety and performance standards and specifications. EXAMPLE COATING: PPG DeSoto 823-011 Integral Fuel Tank Coating – protects the interior of an aircraft fuel tank against corrosion from fuel contaminants. 823-011 is a chemically cured coating which provides maximum protection against water, salt water, aircraft fuels, hydraulic fluids, engine oils, and dilute acid solutions. One of the key concerns in aircraft engineering is safety. Failures can lead to catastrophe, and coatings play an important role in controlling heat exposure, wear, and corrosion of jet engine components. The combination of fuel and heat requires extremely specialized coatings. Safety standards dictate that jet engine turbine blades are replaced when they reach the minimum expected lifetime, regardless of their condition at that point. Coatings are designed to protect and enhance the working of the engine and extend this lifetime as long as possible. Thermal barrier coating (TBC) is one of the most important coatings used for jet engines. The engine is unique in the combination of damaging elements to which it is exposed – extreme cold on the exterior, extreme heat on the interior, erosion, and corrosion are all threats to its safe and effective functioning. A ceramic thermal barrier coating insulates turbine blades against heat and the stress of high speed rotation for extended periods. TBCs are applied as a system not a single coating, usually comprising of a bond coat, a thermally gown oxide, and a ceramic thermal barrier coating (often yttria-stabilised zirconia). EXAMPLE COATING: Yttria-Stablised Zirconia Thermal Barrier Coating – a ceramic coating with low thermal conductivity, an expansion/contraction cycle works with the temperature changes, and extreme durability. Though the temperatures 6 miles in the sky may be cold, overheating is a problem for aircraft due to the heating powder of UV radiation. Traditionally, planes have been painted white for just this reason – it can reduce the temperature of the interior and exterior of the plane by a substantial amount, and save on energy expenditure for air conditioning. There are now solar heat management coatings which allow for a greater colour variety by allowing solar heat to travel through the topcoat pigments and reflect off the white primer coat. AkzoNobel, PPG, and Sherwin-Williams are the top three vendors in the aerospace coatings industry, and all three operate in the US market. The manufacture, development, and supply of coatings for the OEM (original equipment manufacturer) and MRO (maintenance, repair, and overhaul/operations) sectors of the aerospace market is a big business, and there are many companies that provide products for it. AkzoNobel products include the Eclipse, Alumigrip, Aerobase, and Aerodur lines, PPG produces Desothane, Andaro, and Desoto, and Sherwin-Williams aerospace coatings include the JetFlex, SKYscapes, and Soft Swade lines.